Grabbed the last pie at Round Swamp Farm. 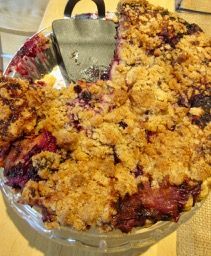 Hillary and I are blackberry-nectarine pie for breakfast. 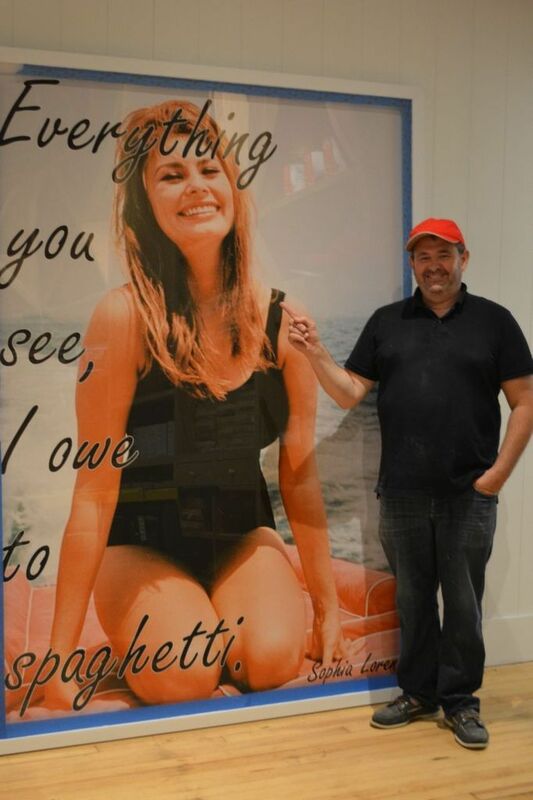 I wrote most of my memoir, Insatiable: Tales from a Life of Delicious Decadence, in their blue bedroom in secluded Amy’s Court at the far edge of East Hampton, but I hadn’t seen my best friend Fran or her caring husband for two years. Hadn’t lazed away an afternoon communing with a seagull in Montauk. Hadn’t seen my friend, cookbook author Hillary Davis and her guy Jim, who gave me a bedroom in Bridgehampton two years ago although we’d never met. 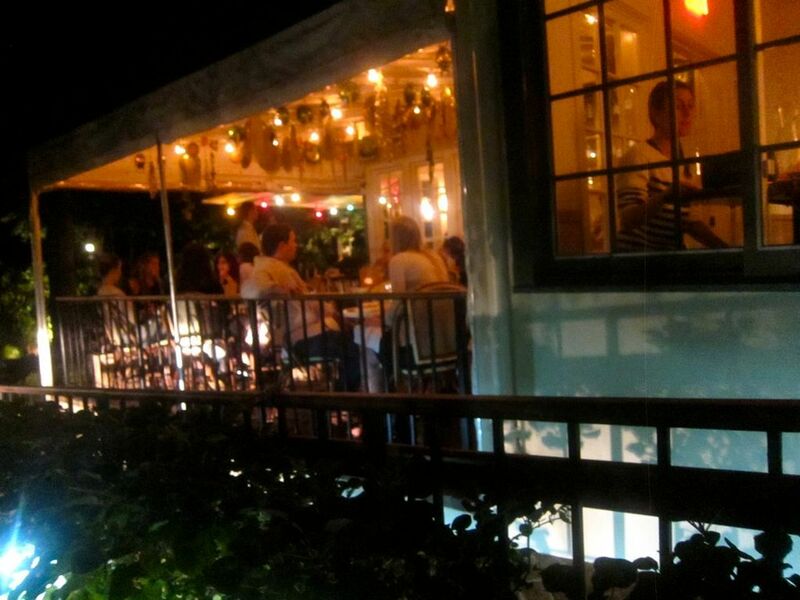 Nick & Toni’s patio is full but my pals and I are installed at the lead table inside where Bonnie brings burrata. 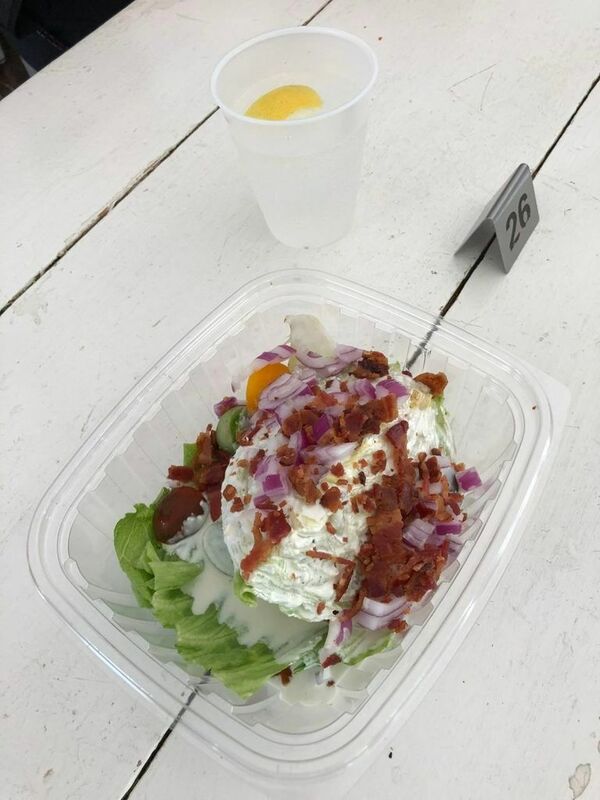 But last week I was back, sharing a wedge salad with mayo from a paper packet at Bay Burger on the Sag Turnpike, basking in a family welcome at Nick & Toni’s and exploring a sophisticated bistro with its own garden in a Water Mill mall. I almost always order Nick & Toni’s chicken roasted in the wood-burning oven. 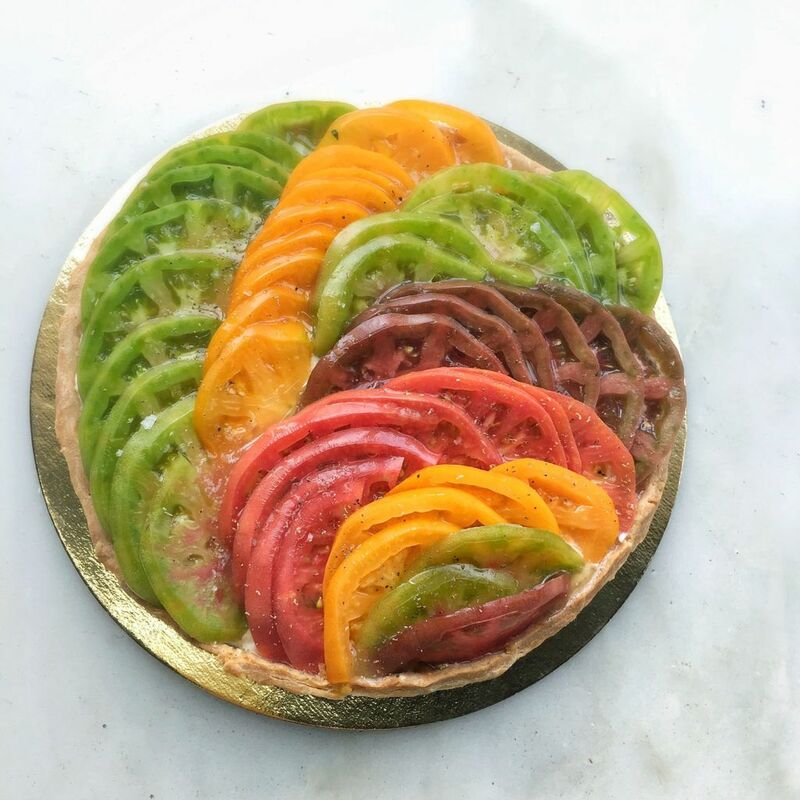 And, of course, having flung myself across the Swamp Farm annex in Bridge and grabbed the only pie left on the shelf, I was wallowing in my favorite decadence – pie atop my yogurt and cereal for breakfast. Yes, the giant round of blackberry-nectarine fruit layered in a lattice crust was offered as a gift to my hosts. But I made the first cut at 8 am, collecting the crumbles, and was comforted in my greediness when Hillary joined me. Of course, I could have pie for breakfast on my yogurt any morning of the week in Manhattan. But I don’t. I wouldn’t. It’s an excess I reserve for the Hamptons. 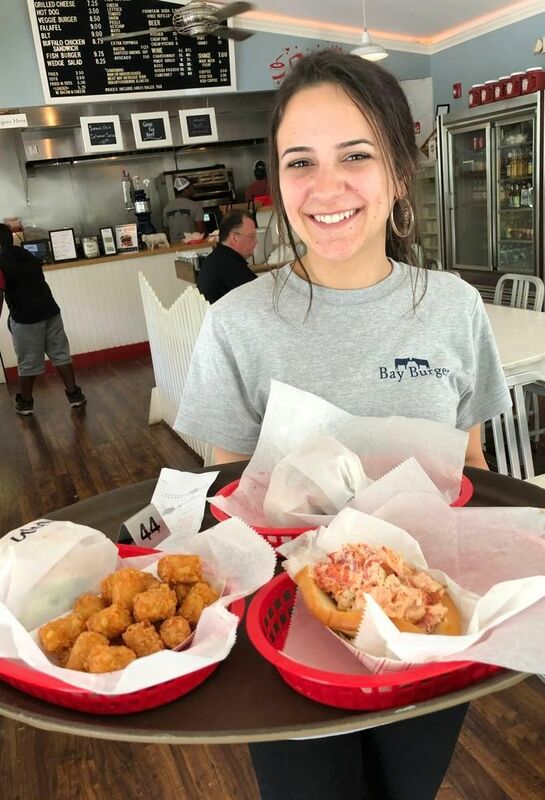 A Bay Burger server totes a tray of made-to-order goodies to customers on the front porch. I arrive on the Ambassador Jitney at 1 pm and have time to hang up a couple of blouses before my friends come to pick me up for lunch. “Where shall we go?” Fran asks. Silly question. 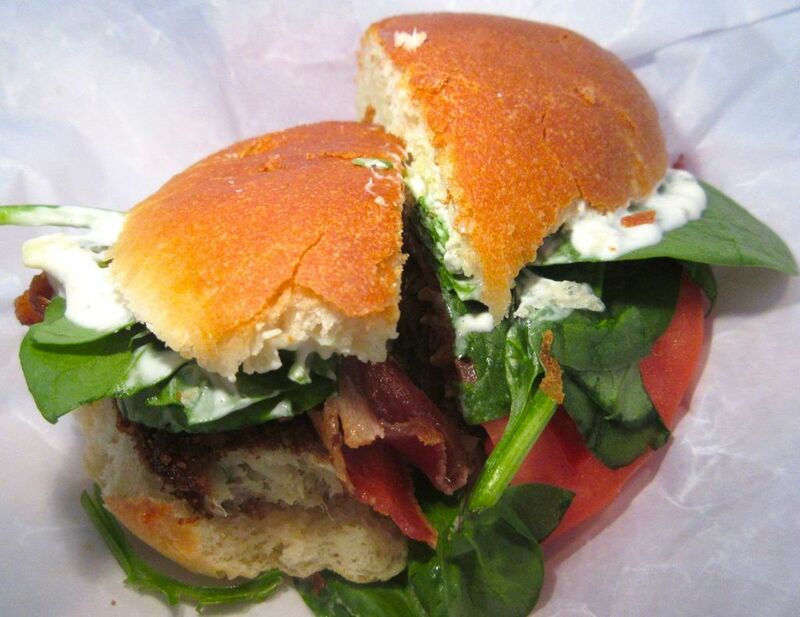 I want to drive directly to Bay Burger where we always go. Usually I order the fishwich with “the works” and fries for my first lunch after arriving on the jitney. The place is empty when we pull in. Usually I get the fishwich. Today I order a rare burger with the works – lettuce, tomato, red onion, bacon, and a side of fries. Howard brings Fran a naked burger. Bun-free. And a mayo-loaded wedge with bacon for all of us to share. Howard’s wedge with mayo and bacon reminds us both of our mothers – for whom lettuce meant iceberg. 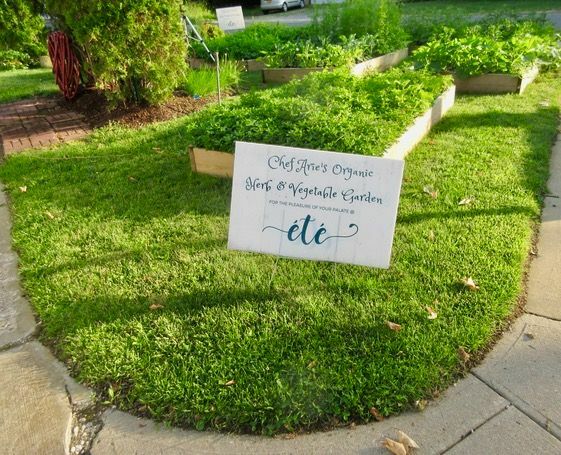 We pass the chef’s little garden of herbs and greens as we head toward dinner at Bistro Été. Chef Arie, Cypriot-born, French-trained, novelist and fussy cook, stops by our table. 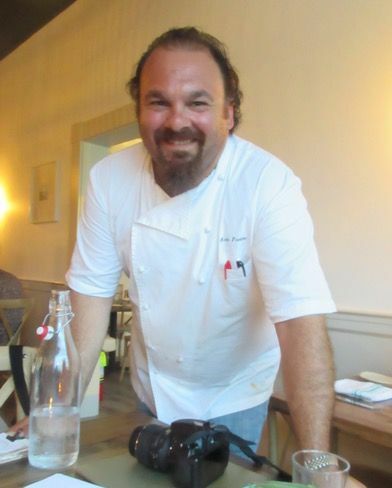 Long Island author-chef Aristodemos Pavlou, Cypriot-born, French-trained, is another Dermont find. She introduces me to Chef Arie. She has reviewed the place and his novels as well, which strike her as unabashedly autobiographical. 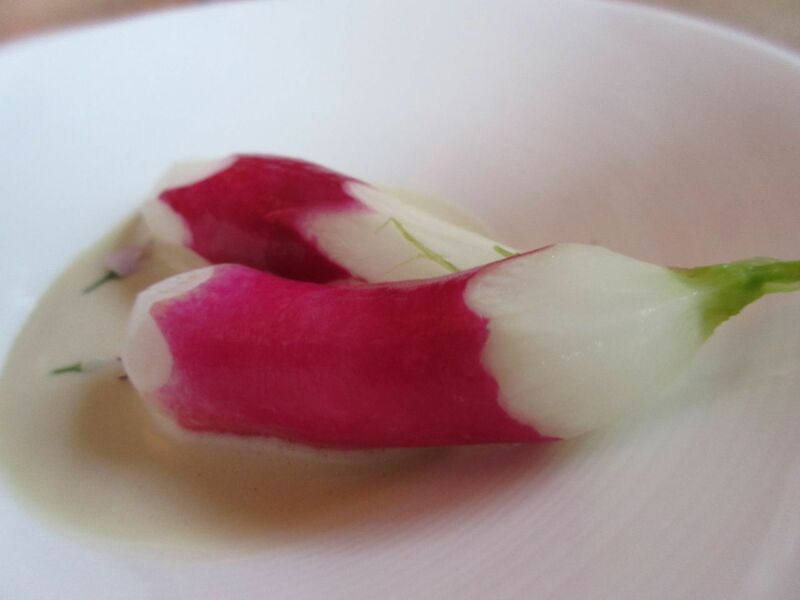 Flowers are frozen in the Bistro’s big square ice cubes. No, I’ve never seen that before. 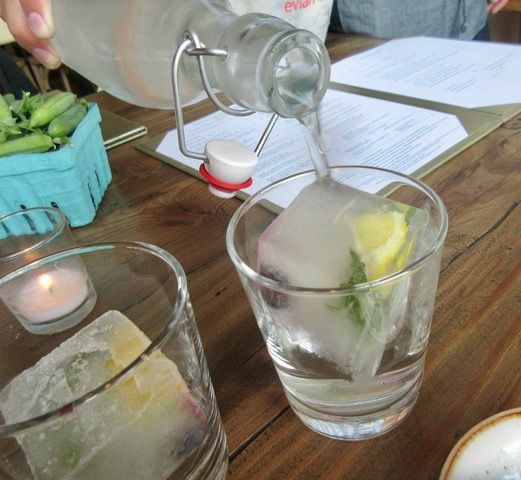 The waiter arrives toting a bowl of large ice cubes frozen with lemon and herbs and drops them into our water glasses. The chef is up front near the bar, wrestling a long length of sugar cane. Of course, he harvests the cane and presses his own sugar cane syrup. Don’t you? 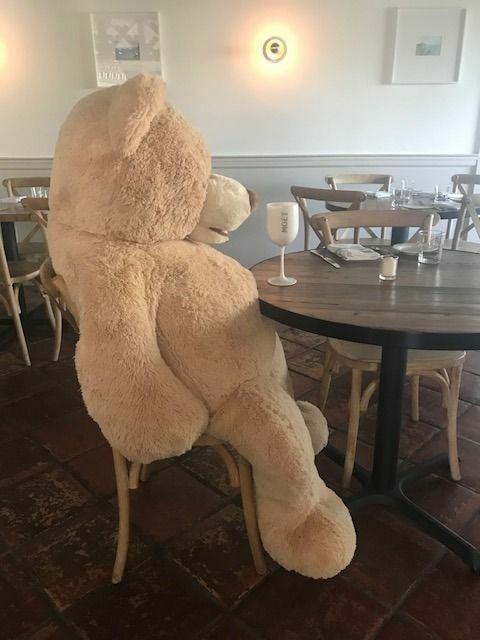 The Bistro’s oversize Teddy Bear gets moved around to keep any solo diners company. There is a giant teddy bear sitting at a table that gets moved to join a solo diner, to keep her company. 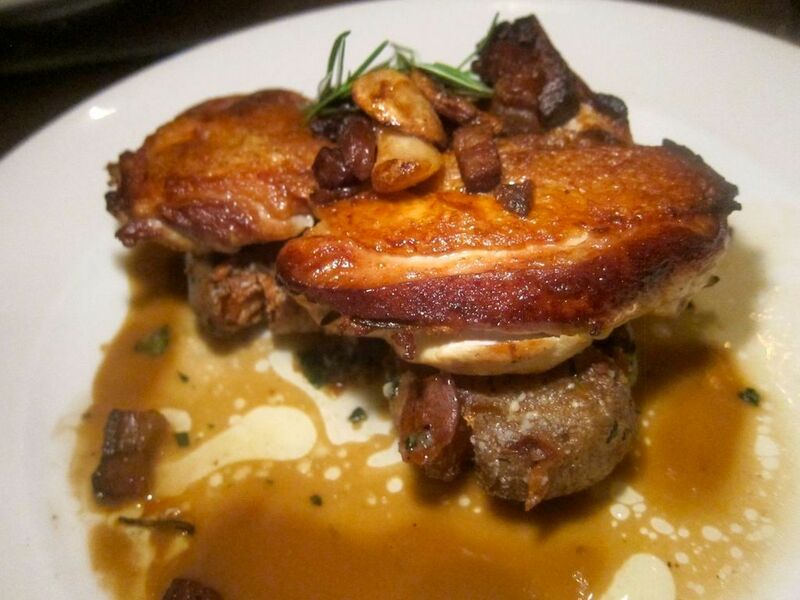 The menu offers to “truffle-ize” anything for $24 extra. 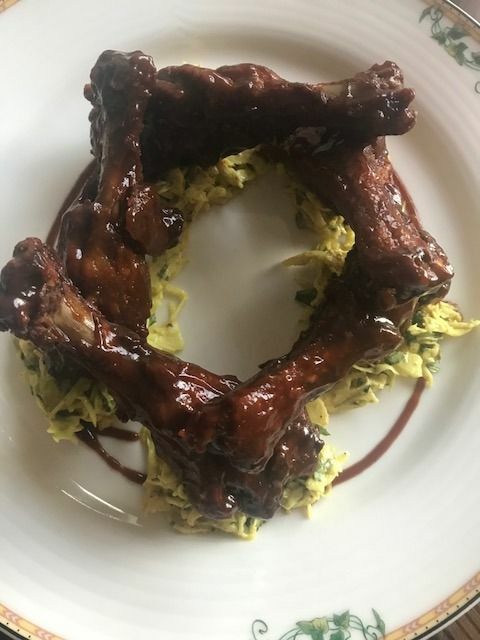 The sticky duck wings confit, glazed with house BBQ jerk sauce and served alongside crispy curry cole slaw stand alone, triumphant. No truffles needed. My favorite dish of the evening. 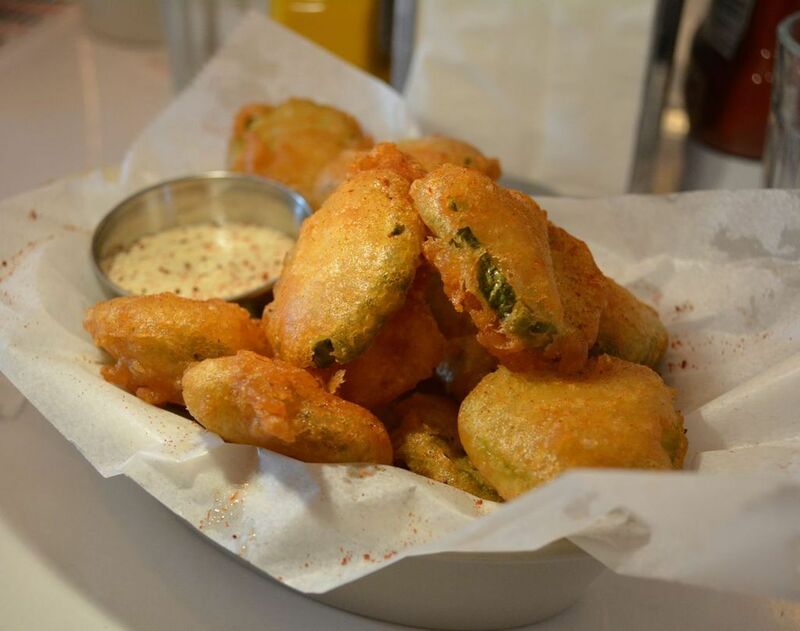 The stuffed squash blossoms are a close contender. The sticky duck swings confit, glazed with house BBQ jerk sauce, are my favorite dish of the evening. 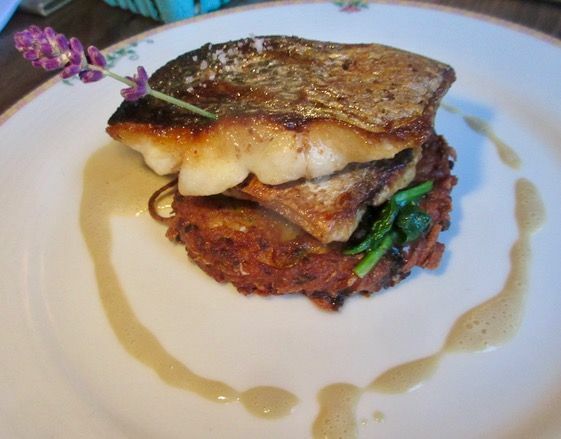 The catch of the day is local hake on a potato pancake. 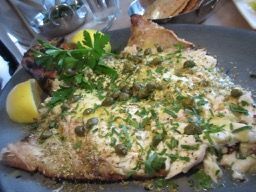 The “catch of the day,” hake on a fat potato pancake with Spanish-olive cream sauce, needs no additional fuss either. House-made pasta with asparagus and morels in a hand-hewn wooden bowl is the essence of spring, though pricey at $42. 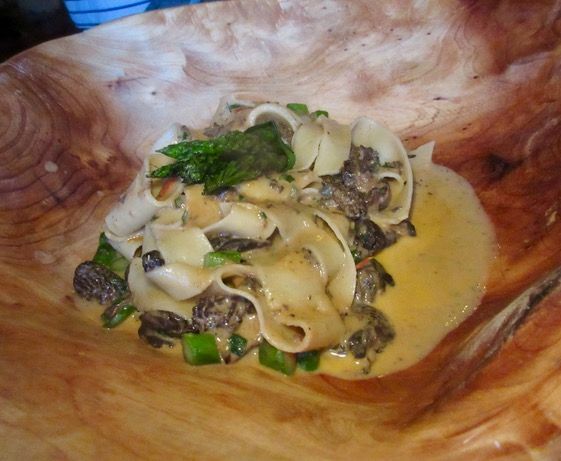 The house-made pasta with asparagus and morels is served in a large hand-hewn wooden bowl. 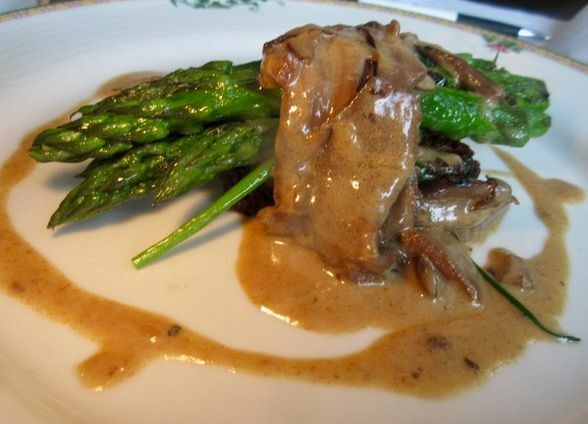 I find the fresh asparagus taste lost in an excess of sauce. Elaia’s red and yellow beet salad is tossed with parsley, pine nuts, Greek yogurt and honey. My friends drive by Elaia Estiatorio Friday afternoon and Howard goes in to get our reservation in the book. Dilara, the owner’s daughter, lets him choose a table for our dinner Saturday night. It seems so easy. It doesn’t feel like Hamptons dinner madness at all. 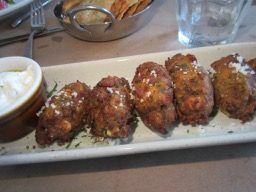 I order Elaia’s Greek-style zucchini fritters with feta and herbs as a starter. Next evening, the narrow front room is besieged, a lineup eating at the horseshoe bar under woven lampshades with another platoon on banquettes against the wall. In the next room, young women with naked backs and hungry dates face each other at a six top, making us feel as old as we are. The tableware is a mix of rustic and pretty, with flowers. The house sends classic spreads and crisps as a welcoming gift. 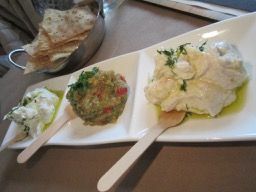 Our waiter brings a bowl of olives and little yogurt balls to spread on bread along with crisps and a trio of spreads: roasted eggplant, fava purée with pickled onions and capers, and tzatziki, Greek yogurt with cucumber, garlic and vinegar. Others tend to merely sample a bite or two, leaving me to finish for us all. The bill notes that we’ve got the extra large whole red snapper priced at $68, more than enough for all to share. 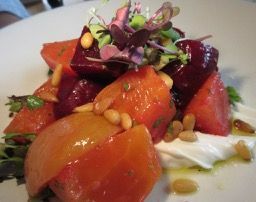 I offer tastes of my appetizer, small oval zucchini fritters with feta and herbs, and accept a portion of Howard’s roasted beets, huge chunks of red and yellow dressed with pine nuts, garlic, yogurt and, surprisingly, honey. I’m feeling full by the time my lamb-and-beef meatballs arrive along with the giant whole red snapper my friends plan to share. Though priced at $68, it still seems like a lot of fish for the money: glazed and not over-cooked. It’s very good and could easily feed four. I plan to return if I’m lucky enough to get invited for another weekend in paradise. 95 School Street. 631 613 6469. 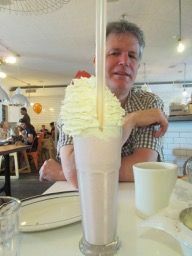 LT Burger sends out a strawberry shake with three wide straws for our Sunday brunch. It’s become a Hamptons weekend tradition for me now: Sunday brunch at Laurent Tourondel’s popular LT Burger on Sag’s Main Street before heading home. LT Burgers fried dill pickles might fill us up before the lobster roll arrives. I can’t stop with just one or two. “I sit with my back to the wall and look mean,” I assure her. 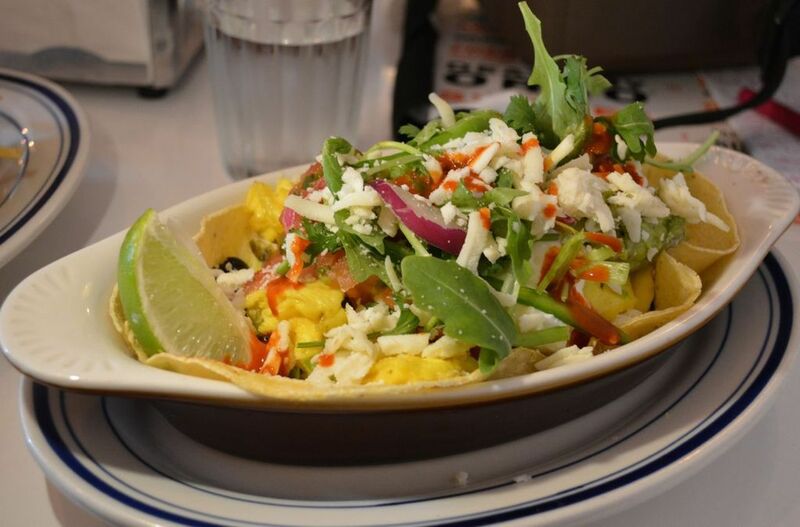 Huevos rancheros is a classic choice for brunch-lunch at LT Burger. On Sunday the house sends fried dill pickles and a strawberry shake with three straws as a welcome. That leaves room for most of a lobster roll and the Mexican burger with guacamole, pickled jalapeno, Monterey Jack and sour cream. My friend Stacy has huevos rancheros and her husband tackles the East End Pile-Up. 62 Main Street. 631 899 4646. 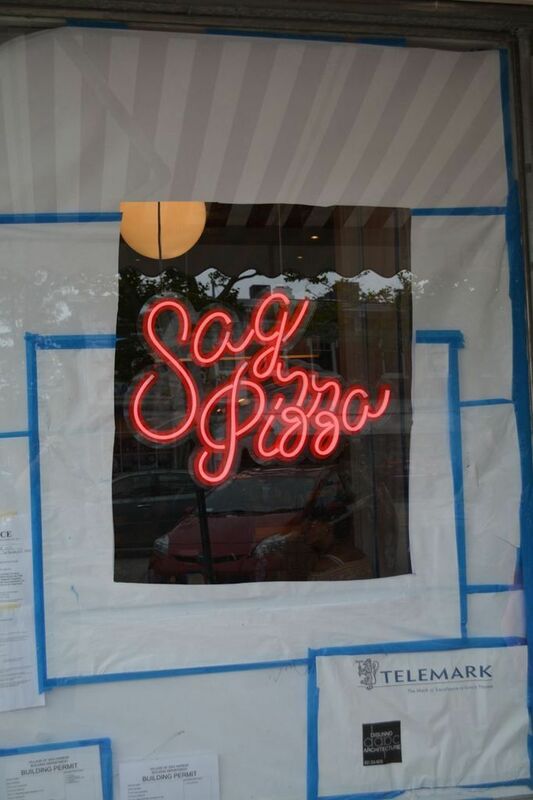 Chef-Owner Laurent Tourondel hopes to open Sag Pizza across the street by mid-July. 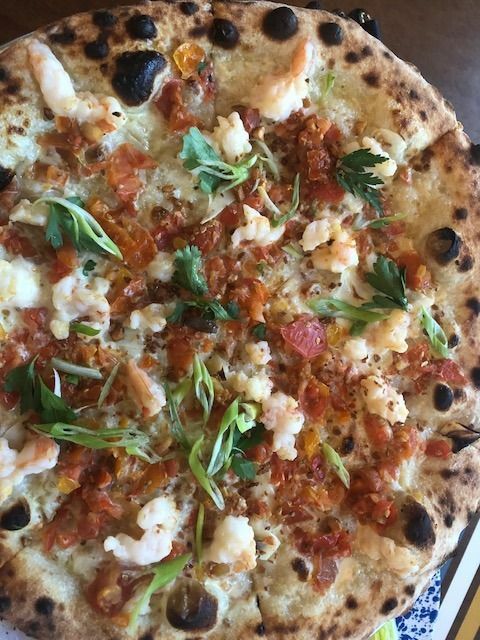 Sophia Loren at her ripest won’t mean much to millennials or gen Xers, but we remember when pizza went local. We decide to walk across the street to see if Tourondel is there behind the butcher paper at his new Sag Pizza, soon to open where Conca d’Oro used to be. The space is definitely a work site. The chef has moved the oven up front and features a homage to Sophia Loren. He hopes to be open by mid-July. 103 Main Street. 631 725 3167.